A-HOTEL.com - Luxury and cheap accommodation in Losinoye, Russia. Prices and hotel, apartment booking in Losinoye and surrounding. This indicative offer was derived from the most recently booked accommodation in Losinoye and sort by the price, from cheapest Losinoye accommodation to the most expensive hotels. To select accommodation by your preferences we recommend to choose from 1 accommodation offers in Losinoye in total. By entering the dates of your overnight stay in Losinoye and using the filter tools you can sort the best possible accommodation for you. The entered dates of your stay are crucial for the most accurate offer as it derives all the online information on pricing and availability of Losinoye accommodation. Then you can book the selected Losinoye lodging (hotels, apartments etc.) immediately. Situated in Kirov, Mini Hotel Ozero has free bikes, garden and free WiFi. Featuring a 24-hour front desk, this property also provides guests with an outdoor pool. Located in a quiet area of Yukhnov, Eco-Village Uhnovgrad features self-catering accommodations with an indoor swimming pool, an on-site restaurant serving Mediterranean themed cuisine, and free Wi-Fi. Cottages here offer a fully equipped kitchen with an oven, stove, refrigerator, dishwasher, and electric kettle. Oversleep Hostel is set in Uhnov and features a shared lounge. All rooms boast a kitchenette and a private bathroom. Located in Uhnov, Iceberg Ugry Hotel has ski-to-door access and bar. Among the facilities of this property are a restaurant, free shuttle service and a 24-hour front desk, along with free WiFi. Guest house in Yukhnov is offering accommodation in Uhnov. All rooms feature a flat-screen TV with satellite channels and a private bathroom. Motel 205km is offering accommodation in Kolykhmanovo. Boasting a 24-hour front desk, this property also provides guests with a terrace. 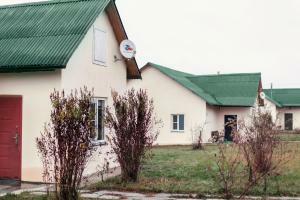 Guest House U Druga offers rooms in Veshki. Boasting room service, this property also provides guests with a restaurant.